Happy Christmas everyone. To celebrate the occasion, why not have some mulled wine? Giggle Loop-style! First, cut the orange. Then juice it. Measure out a spoonful of ground ginger. Feed it to a nearby friend. Pour a bottle of red wine in to a saucepan and warm it in on the hob at a medium-high heat. Add a glug of Masala to the wine. It’s a sticky fermented fig stuff that will sweeten it right up! Add the squeezed orange juice too. Separately, mix 1tsp of ground ginger, 1 “baby’s nose” of Ground Cinnamon, 1 tsp of mixed spice, 1tsp of cloves, and “a bunch” of sugar (probably three teaspoons). Add some orange juice for good measure. Taste the wine. Don’t worry, it won’t taste great, but it will get better. Add the spices. All of them. Let it simmer for 10 mins or so. Add more orange juice if you feel like it. Swap clothes with your friends and see if anyone notices the difference. Add dark rum for the finishing touch. Ladle the rind in to a sieve, then pour the wine through the sieve in to a jug. Serve the wine in to a nearby mug. Spill the wine on the floor. Consider using a ladle to serve. Throw away the Brussels Sprouts, put the pancetta back in the fridge and eat the Terry’s Chocolate orange if you feel inclined. Then subscribe to the Giggle Loop Podcast on iTunes or Soundcloud. Subscribe to the Giggle Loop YouTube Channel. Take a pair of Neurofen if it gives you a headache. 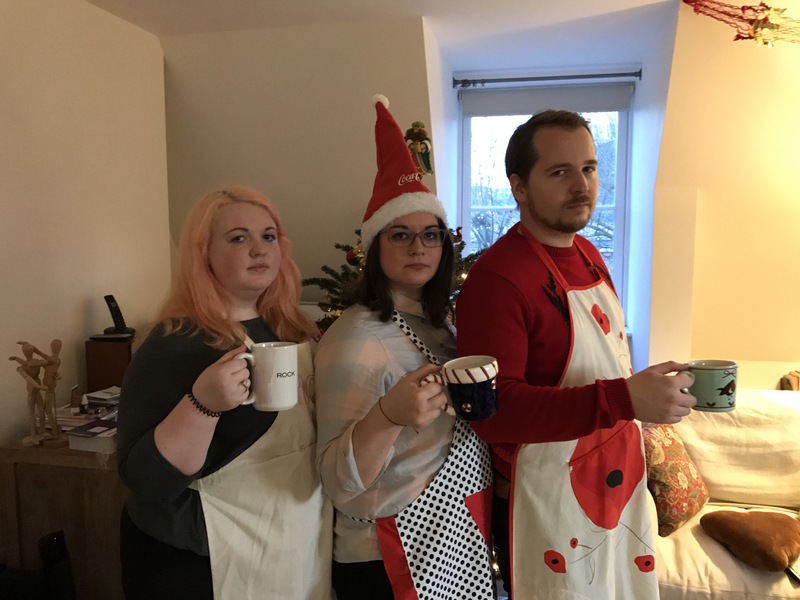 This entry was posted in Uncategorized and tagged comedian, comedy, cookery show, disgusting, epic fail, fun, Funny, Hilarious, mulled wine, recipe, silly, sketch, skit, tasty, wrong. Bookmark the permalink.